If you apply for a new PC Financial Mastercard between Jul 14 to Aug 10 Sep 30, 2018, you can earn 135/125/115 points per dollar spent at Shoppers Drug Mart for the rest of the year, which is equal to 13.5%/12.5%/11.5% cash back return. The normal return is 45/35/25 points per dollar spent at Shoppers Drug Mart. BTW, If you buy gift cards from Shoppers Drug Mart, you can earn 120/110/100 points per dollar spent. This is a great offer. If you don't have a PC Financial Mastercard, I think now is a good timing for you to apply one. 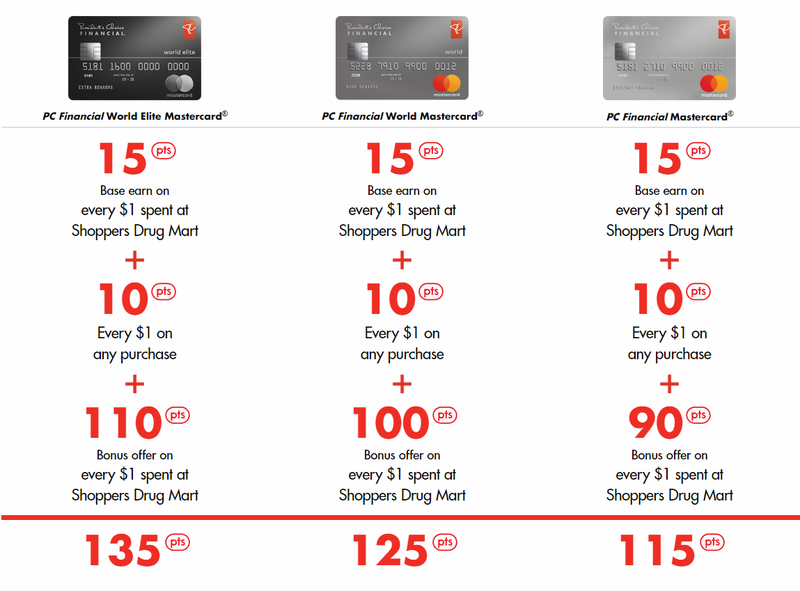 If you already have a PC Financial Mastercard, you can still earn these extra points on all purchases made with the applicable PC Financial Mastercard at Shoppers Drug Mart until August 10, 2018.